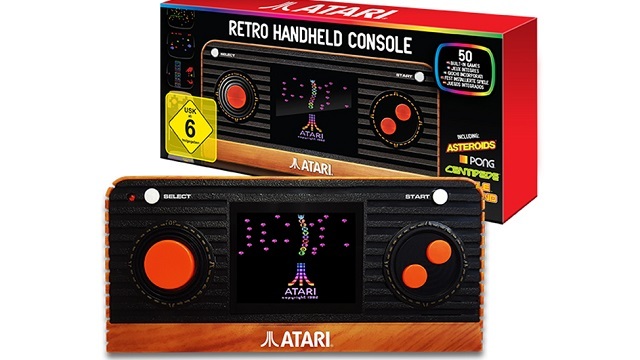 Today Atari’s Retro Handheld has been released. It has fifty games included in it and it has an A/V output so it can be played on a bigger screen. Additionally, Atari’s Retro TV Joystick also launches today. You can take a look at the press release below. The Atari Retro Handheld packs everything that was great about the Atari 2600 into a compact, portable handheld unit with a 2.4 inch colour screen. Sporting the immortalised wood veneer effect of the original console, it has 50 classic games built-in, including: Asteroids®, Pong®, Centipede®, Missile Command®, Breakout®, Millipede® and more. The Atari Retro Handheld and Atari Retro Joystick are available now from FunstockRetro.co.uk and Amazon.